Will Drinking Alcohol Warm You Up? Hate to be a downer, but drinking alcohol is not going to warm you up when you're cold—and even worse—it could actually be dangerous. My favorite Saturday morning cartoons loved to show St. Bernards bounding through snow-covered mountains with casks slung around their necks, bringing brandy (which always had bubbles for some reason) to wayward mountain travelers. It turns out that the St. Bernards of St. Bernard's Monastery in the Swiss Alps might occasionally carry milk in a cask, but never brandy. They were trained as rescue dogs, however, so that part is true. 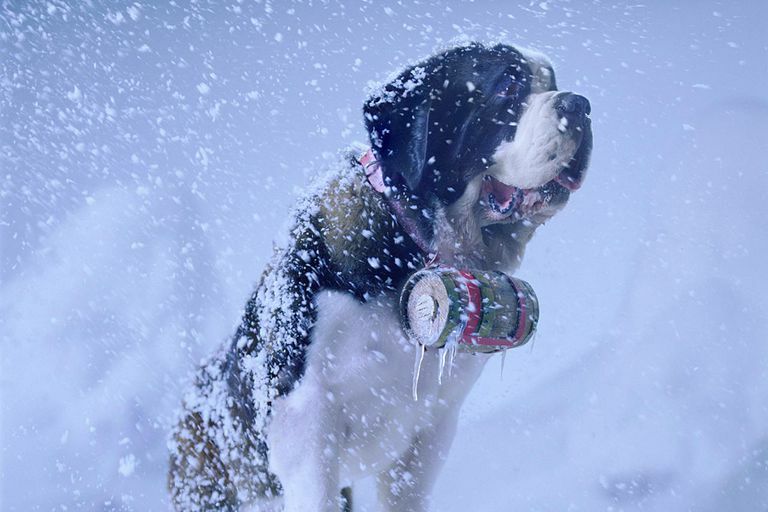 Even though St. Bernards might not be carrying alcohol around, plenty of modern skiers carry bota bags filled with wine or brandy when they're on the slopes. They claim the alcohol warms them up at the top of the mountain. I'll leave the wisdom of skiing drunk for another discussion, but for now, let's talk about alcohol as a chemical warming agent. Alcohol has a much lower freezing temperature than water; vodka and other 80 proof (40% alcohol) liquors have a freezing point of about -22 degrees; water freezes at 32 degrees. It stands to reason that alcohol would chemically be somehow warmer than ice and snow. The truth is that a lower freezing temperature has everything to do with the chemical composition of the alcohol and nothing to do with any magical properties it may have to warm us up. Basic physics means that drinking a cold beverage will draw heat from your body, and drinking a hot beverage will add heat to your body. Theoretically then, alcohol shouldn't add or subtract heat differently than any other beverage. "But Alcohol Makes Me Feel Warmer!" Of course, you knew it couldn't be that simple. Alcohol has a reputation for warming us up on cold days because it makes us feel warmer when we drink it. Unfortunately, when we're skiing in snow and we take a sip of brandy to give us a warm little pick-me-up, we aren't heating anything at all. Instead, we're letting more blood flow past the surface of the skin, where the cold outside air is able to steal a little bit more heat from our core. Thanks to the brandy, we're actually getting colder, not warmer. Alcohol does nothing to warm us up and is a quick way to get hypothermia in a cold environment. It may be a bummer to switch your bota bag from wine to water. Just remember, there's still a fire and a hot toddy waiting in the lodge at the bottom of the mountain, not to mention how much safer it is to drink after you're done skiing, as long as you don't drink too much. Yoda T, Crawshaw LI, Saito K, Nakamura M, Nagashima K, Kanosue K. Effects of alcohol on autonomic responses and thermal sensation during cold exposure in humans. Alcohol. 2008 May;42(3):207-12. doi: 10.1016/j.alcohol.2008.01.006.